The amount of data on the dive and diver makes the Gen7 diving equipment so easy to use. Colorado Time Systems, a PlayCore company, is pleased to announce the release of the new Gen7 diving equipment. Gen7 diving software and hardware were developed to meet the requests made by USA Diving and FINA to have wired judging systems in place for elite diving events. 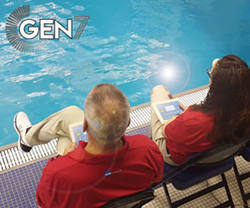 The Gen7 diving system has been used at major events including: USA Diving Winter Nationals, UANA Puerto Rico Grand Prix, USA Diving Synchronized National Championships, Big 10 Championships, NCAA Championships, and more. The system will also be utilized at the upcoming USA Diving Olympic Team Trials in Indianapolis this June. The software and hardware support FINA (including mixed synchro), USA Diving, NCAA, and high school (including CIF 1m/3m springboard) rules. Gen7 diving software features a modern, intuitive interface and work flow, and is optimized for touch screens. The Gen7 diving judging terminals feature a sealed keyboard with a backlit LCD display suitable for indoor and outdoor sunlight readability, and a rugged locking communications cable that connects each judging terminal to the diving interface box to ensure that no connections will inadvertently come loose during a meet. About Colorado Time Systems (CTS): Colorado Time Systems, a PlayCore company, has established a reputation for precision and innovation in swim timing equipment. Since 1972, premier aquatic facilities have chosen Colorado Time Systems for platinum quality timing, scoring and display systems. Learn more at http://www.coloradotime.com. About PlayCore: PlayCore helps build stronger communities around the world by advancing play through research, programs, and partnerships. They infuse this learning into their complete family of brands. PlayCore combines best in class planning and education programs with the most comprehensive array of recreation products available to create solutions that match the unique needs of each community they serve. Learn more at http://www.playcore.com.